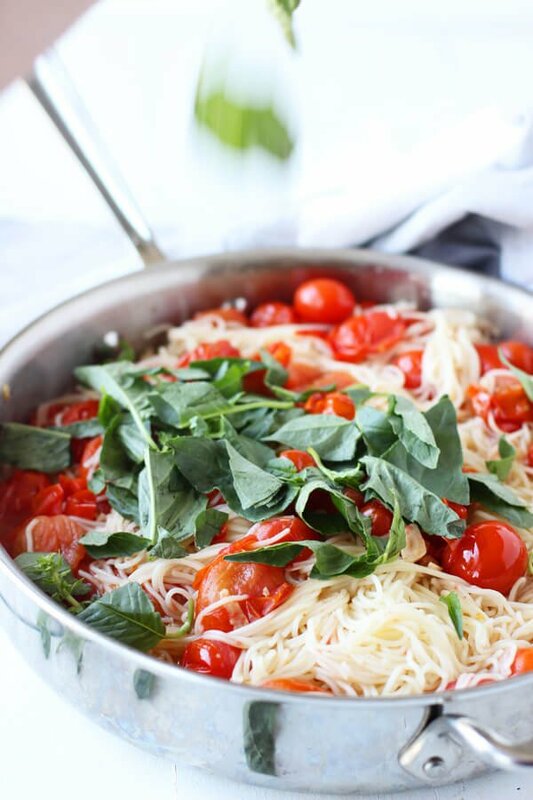 This 20 Minute Cherry Tomato and Basil Angel Hair Pasta comes together in a jiffy, and will satisfy the whole family, even the kids! Once the end of summer come around, I’m immediately drawn to a simpler way of cooking – lighter, healthier meals, fresh ingredients, less ingredients, and just an all around relaxed attitude. 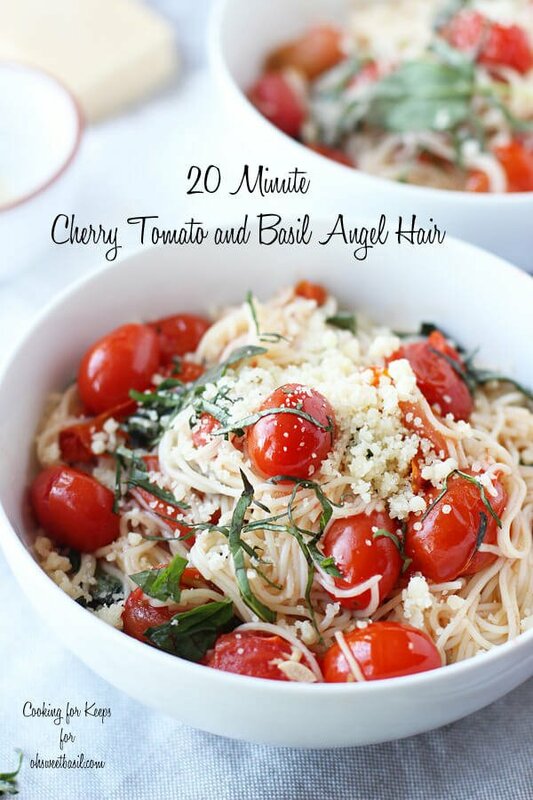 I don’t like anything too fussy or involved, and this 20 Minute Cherry Tomato and Basil Angel Hair pasta is the perfect example of what you might find on our dinner table this month. I’ve made a variation of this sauce for years – ever since I studied abroad in Italy. On the back end of my trip, my family came over, and my Mom and I took a cooking class for four days on the Amalfi coast in a little town called Positano. We learned the basics of Italian cooking – how to make the best margarita pizza with only the freshest ingredients, how to make pasta dough with our bare hands, and how to make a killer tomato sauce using only cherry tomatoes, olive oil and garlic. I can still remember closing my eyes while I ate, and wondering if I’d ever taste something as delicious as that sauce back at home – or if I’d even come close to being able replicate it myself. Since then, I’ve made a bazillion different variations, all equally as delicious as they were in Italy. I’ve used it as a topping on fish or grilled chicken, slathered it on garlic-rubbed crostinis and tossed it with scrambled eggs, but I think today’s version may be my favorite adaptation yet. Not only because it’s simple and delicious, but because the cooking time from start to finish is less than 30 minutes – pure gold in my book. The sauce starts with a small army of thinly sliced garlic that take a bath in hot, but not screaming hot olive oil. Two pounds of cherry (or grape) tomatoes are then thrown in, the heat is cranked up, and you just watch as the hot oil works it’s magic on the tomatoes, making them blister and explode as they cook. I like to help the process along a little bit by adding a ladle full of starchy pasta water and a good amount of kosher salt. The sauce simmers for a few minutes, and then slightly undercooked angel hair is tossed with the burst tomatoes. Since the pasta is just slightly underdone, it finishes cooking in the sauce, infusing SO much flavor into each strand of pasta. Once everything is melded together, I toss in a good handful of parmesan cheese, about a cup of fresh basil and more pasta water if need be. Simple. Fresh. And seriously delicious. 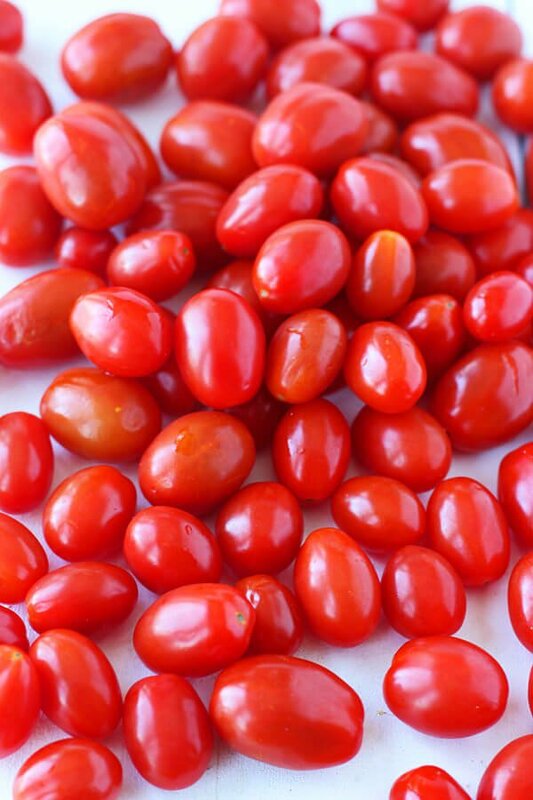 I used to think that small red tomatoes were all cherry tomatoes. I didn’t really take the time to notice that some were more oval and that they tasted slightly different. But they are different and I’m a grape tomato fan. If you don’t like one tomato you may like the other, so let’s take a look at what is the difference between cherry and grape tomatoes. Grape tomatoes are oblong and shaped like, well like grapes. They’re about half the size of cherry tomatoes, with thicker skins. Grape tomatoes aren’t as sweet as cherry tomatoes, but they still have that great tomato flavor, and their flesh is meatier and less watery. We especially like that they are less watery as it’s more about the flavor than all of those clear juices running out. 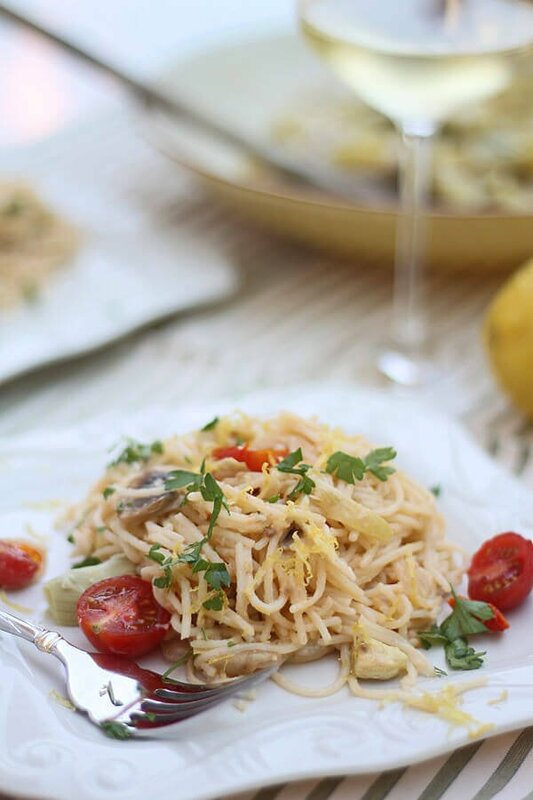 Angel hair pasta is a little different than your typical pasta as it’s very thin and happens to be our preferred pasta. We like how light the pasta is and it allows whatever ingredients you add to it to really shine versus a heavier spaghetti. The general rule is 2 ounces per person, so if you have the package and it’s usually 16 ounces a package then you can half it, split that into quarters and you’ve got 2 ounces but if you’re like me and end up with pasta in containers it can be tricky. I grew up learning the finger method for measuring pasta which I think works pretty well. You can watch how to measure dry pasta with this video. This cherry tomato and basil angel comes together in under 20 minutes, making for a a delicious and super easy meal for your family! Add in a good handful of salt. Add pasta. Cook aldente or until pasta is slightly undercooked. Using tongs remove pasta from water into a colander. Reserve cooking liquid. While pasta is cooking, add garlic and olive oil to a very large skillet. Turn the heat on medium and cook until garlic becomes soft, about two minutes. Turn the heat to a medium-high and add tomatoes and salt. Cook two minutes. Add 1/2 cup of starchy cooking liquid leftover from pasta. 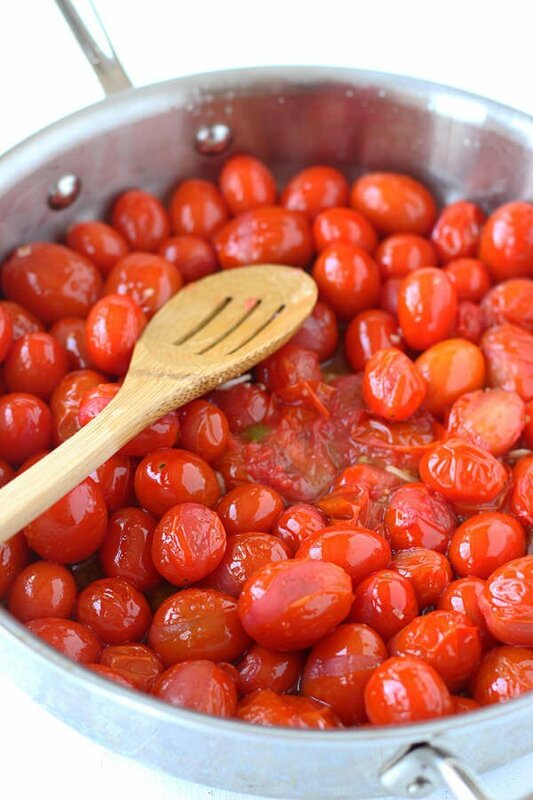 Bring the mixture to a boil and reduce to a simmer for five minutes — the tomatoes should be starting to burst. If they haven’t gently push on them using the back of a wooden spoon. You only want about half to burst. Add pasta, cook another two minutes. Turn the heat off, add basil and parmesan cheese. If needed add more starchy pasta water. Serve with extra grated parmesan cheese. A fresh and easy dinner. Oh how we love this recipe for an appetizer or dinner! It is one of my go-to’s on busy nights! It’s so yummy! Thanks for leaving a comment, Lisa! What a fabulous quick recipe from Nicole! I love to add in rotisserie chicken as well! Thanks! Okay, I have to say I never leave reviews on recipes, I mean NEVER. However, this recipe was absolutely fantastic! I did change a few things to adjust to what I had on hand – instead of fresh basil, about 1 tbs (I eyeballed); 1 1/2 spinach; 2 cups shredded rotisserie chicken. Other than that, followed the recipe and loved it! Thanks for sharing! Made this tonight, and not only was it super quick and simple, but so, so delicious!! It is light but so full of flavor…I can’t wait for leftovers tomorrow! 😉 Thanks for the recipe!! This is one of my favorite recipes. I so love basil that I find sweet basil a little bland. If you have an Asian market anywhere close, try it with Thai basil. It is more pungent and aromatic, and an added plus is it lasts several days longer than sweet basil. Don’t refrigerate left over basil. It doesn’t like the cold temp. I made this last night with plum tomatoes, oregano, and basil from the garden. Then I was making a chicken dish so at the end I put in the chicken juices from the pan. It was really delicious. My husband couldn’t stop eating it. I haven’t had much luck with angel hair because I always overcook it. But undercooking it then finishing it up in with the sauce was a new technique and worked. Isn’t that such a great way to not end up with soggy noodles? Thanks Jeanne! This recipe is excellent! Easy, delicious, inexpensive, easty-to-find ingredients, and pretty. I made something else recently that I THOUGHT was this recipe, and it was terribly disappointing. I have now pinned this one, bookmarked it, and shared it with friends so I don’t lose it again! 🙂 Yum! i have made this recipe numerous times since i discovered it, it’s my go-to last minute meal. i love it!! 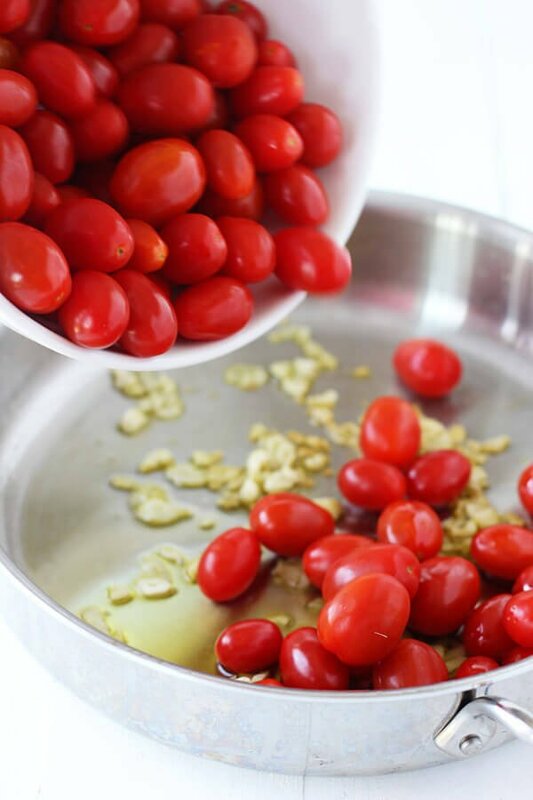 so quick, easy, tasty – i love watching the little tomatoes cook. thank you! wonderful post! So glad to hear that, thanks! This recipe sounded so good to me, but I knew my family would want some kind of meat. So, I sauteed some chopped chicken breasts, then proceeded with the garlic, tomatoes, etc. I also threw in a handful of fresh spinach right at the end. WOW!!! So delicious, not heavy, yet very satisfying and filling. Thanks for the recipe! I looooove adding chicken to easy dishes like this! Thanks for taking the time to comment Kathleen! 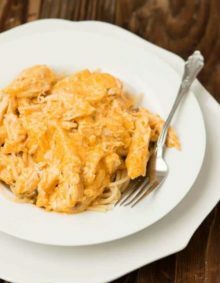 I know this an old post, but I found it searching for an easy, quick pasta recipe with the ingredients I already had on hand. I noticed a couple at least one poster asked about vegan options for the parmesan cheese. so I thought I’d throw in my two cents. A great alternative for grated parm==or anything that needs that cheesy flavor–is nutritional yeast (which is not really yeast). It’s available at any health food store and probably online as well. I also use The Vegetarian Express “Parma Zaan Sprinkles,” which I get at my local Seventh Day Advendist grocery store. I don’t usually use a lot of grated parm, so that product will suffice on the rare occasions when I do use them. I intend to use a combination of both nutritional yeast and the faux parm sprinkles in this recipe. Pam, I love that information. Thank you! So glad you enjoyed it! What are you studying in college? You had me at 20 Minutes 🙂 this is the perfect weeknight meal!! All I can say is ….. OMG. Not only was this so simple to prepare but it was fantastic. What more can you ask for SIMPLE but FANTASTIC. Thank you so much for sharing this with us. Divine!!! Made this yummo healthy pasta, although I didn’t have the right amount of tomatoes, it didn’t matter or effect the outcome. I did add some flavored Italian Olive Oil as well as simple olive oil. So light, my husband was depressed there wasn’t more….I served 5 on this recipe but added 1/4 more pasta. Thank you. My favorite!!! This was so simple and SO delicious. I have been trying to eat vegan more often so I didn’t have any parmesan on hand and simply omitted it (adding a tiny splash of balsamic vinegar to the mix for the depth/savory element the cheese would have provided). I’m sure it would be even more delicious with it, but I didn’t miss it! Thanks for such a clean, elegant recipe. Hooray! So glad you enjoyed it, Arwen. This looks very light and fresh!! I’M GOING TO MAKE THIS RIGHT NOW! I surprised my Mom by making this for our Mothers Day dinner. It was delicious! She enjoyed it very much, as did the rest of my family. We put the leftovers in the fridge, and they were still just as tasty after a couple days. 🙂 Thank you so much! 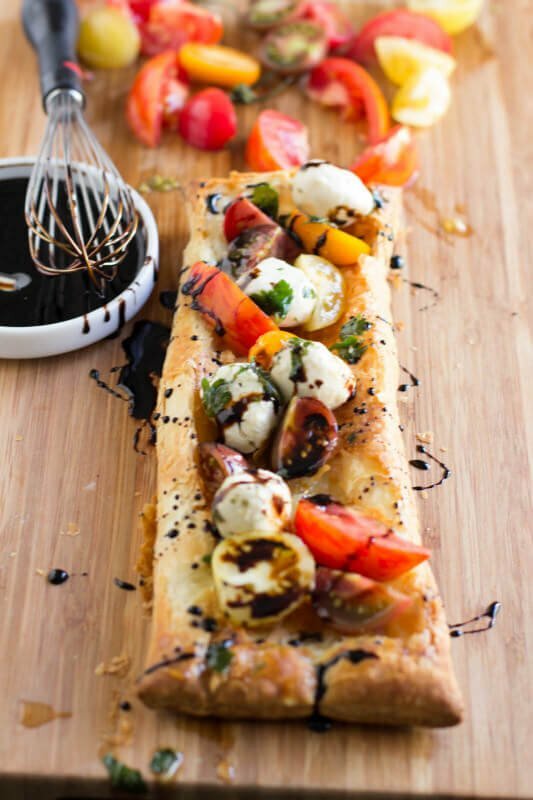 Looks so good, going to making it for mothers day, do you have to use cherry or grape tomatoes or can you use regular vine tomatoes? You can definitely make this with regular vine tomatoes, but they tomatoes won’t burst like they do here, I’d recommend using the grape or cherry still, or even a small version of vine tomatoes. Your recipes look so yummy…can’t wait to try them. I would love to see the recipe for Creamy Lemon Pasta with Artichokes and Cherry Tomatoes and heirloom berry quinoa salad. I tried to click on the name and/or photo of each but have been unable to access the recipes?? Thanks Marsha!! There should have been links in the post, I just clicked on the Creamy Lemon Pasta and it worked, but just in a case yours doesn’t here is the link for the Creamy Lemon Pasta and the Heirloom Berry Quinoa Salad. Hello! I made this last night, very tasty! The recipe made a lot and I was wondering, can I freeze the leftovers for later? Well I just realized that I used 16oz angel hair pasta instead of 8oz, no wonder I have so much leftover! Shelly, oh no!! Haha. I hope that the sauce to pasta ratio was still alright. I’m not sure if you can freeze it or not, since angel hair is so delicate I imagine it might not survive, but it doesn’t hurt to try! Oh my! This looks divine! I made this for dinner tonight and it was amazing! It had so much flavor for only a few ingredients. I added peas to it and made a salad to go with it. It was very easy and I will definitely be making it again! Love the addition of peas! Oh my… this looks absolutely delicious – your photography is amazing!! I love simple meals like this! This looks so yummy! Love the freshness of this dish, sounds like a great time on the Amalfi coast. What a fabulous quick recipe from Nicole! 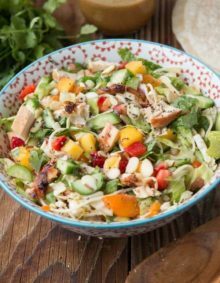 This is totally my kind of spring/summer meal – colorful, flavorful and so easy! Totally agree! Isn’t it great?! So vibrant and delicious, all of my favorite flavors! So fun to see Nicole over here! I am all about this pasta….20 minutes to carby goodness? So in! Pinned!